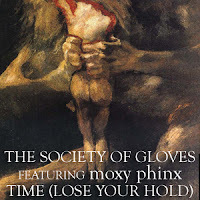 Within the next day - probably Tuesday - The Society of Gloves will officially unveil "Time (Lose Your Hold)," featuring moxy phinx. The song will be linked above for download and streaming, as well as on our MySpace music profile. We recorded the basic tracks for the song in September, Katrina Lenk of moxy phinx recorded her vocals in October, and the Society finished the recording and mixing process earlier this month. The song will be featured in Mutiny Universe's Outcasts, coming to a film festival near you! As far as the album art goes, it's basically another section from Goya's Saturn Devouring His Son, as is the cover art for "Who Are Your Friends?" The ancient Romans considered Saturn to be "Father Time," so the imagery is obvious in relation to the song title.